These cookies are not just for Christmas, your family will enjoy them all year round. 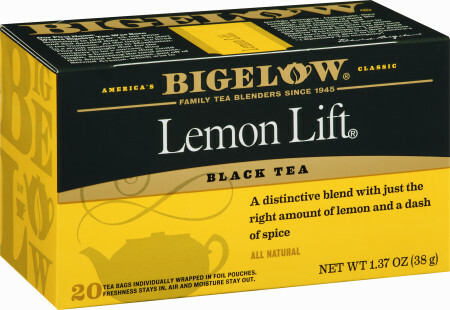 The tangy flavor of Bigelow Lemon Lift Tea makes them mouth-watering. Beat together the sugar and butter until smooth and creamy. Stir in flour and salt, blending until dough is formed. Divide dough in half; shape into disks and wrap in plastic wrap. Chill 30 minutes. Preheat oven to 350° F. Roll dough on lightly floured surface to ¼"" thick. Cut into shapes with cookie cutters, re-rolling scraps for additional cookies. Place cookie shapes on ungreased cookie sheets and bake 12-15 minutes, or until edges start to brown. Remove cookies to wire racks to cool. Drizzle with Lemon Lift® Glaze. *Lemon Lift® Glaze: Pour 2 tablespoons boiling water over 1 Bigelow Lemon Lift® tea bag in a small bowl. Let steep 5 minutes. Remove tea bag, squeezing out liquid. Gradually stir in 1 to 1 ½ cups confectioners sugar until mixture is a glaze consistency, adding a few drops yellow food coloring, if desired.